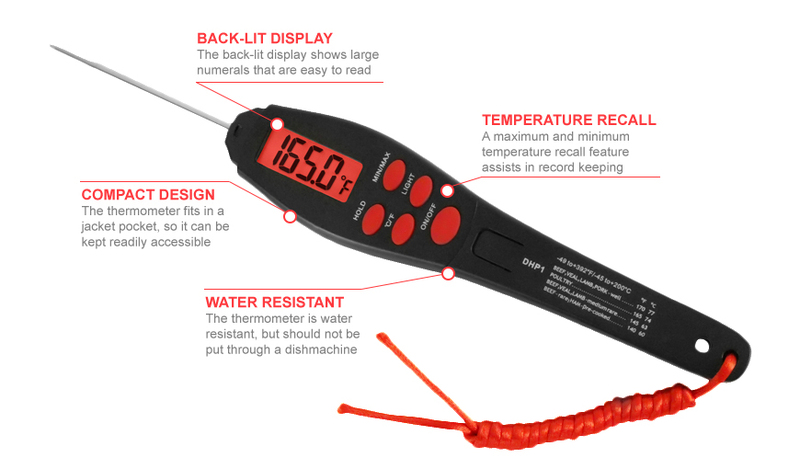 The San Jamar THDGA Escali digital thermometer can fit in a cook's pocket, so it is readily available while prepping and cooking. It can measure temperatures ranging from -49 to 392 degrees Fahrenheit and -45 to 200 degrees Celsius. A recall function lets users pull up the last minimum and maximum temperature, making it easy to keep up with the prep process. The temperature is displayed on an easy-to-read, back-lit display. 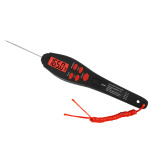 The San Jamar THDGA Escali digital thermometer is water resistant, but should not be cleaned in the dishwasher. It comes with a sheath that protects the probe from damage when it is not in use, and can be used as a handle by affixing it to the opposite side of the thermometer.